Hello all viewers, both old and new (especially if you have just discovered what I do). 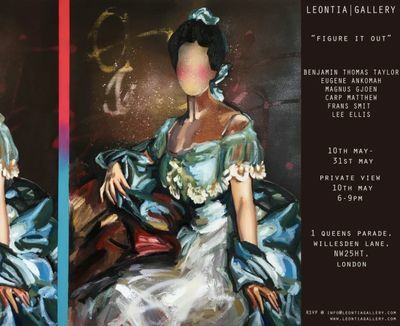 The Leontia Gallery presents Figure It Out an exhibition exploring contemporary figurative painting, from 10th of May until 31st. In an era of digital culture where contemporary art has turned to digital media as the main means of expression and every artist is the master of their own publicity, the Figure It Out exhibition aims to explore the significance of painting today and the numerous possibilities of expression and dialogue thatpainting has to offer. Wide ranges of global contemporary artists have been invited to come together and discuss, through their artistic practice, the past, present and the future of painting. Intertwined within the exhibition is the concept of artist as celebrity, many artists have given a nod to their predecessors, from homages to old master John Singer Sargent, to the pop-art powerhouse that is Warhol.